Ukraine : The Two-Way Also Thursday, ousted President Viktor Yanukovych says he's still Ukraine's leader and asks Russia to protect him. Along the border, Russian fighter jets are on patrol. We're adding updates throughout this post as the day continues. 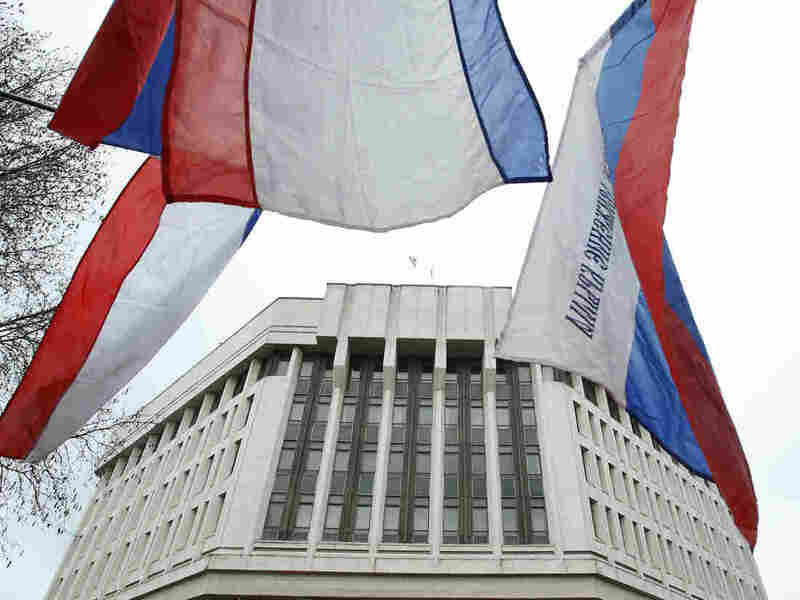 Flags fly outside the Crimean parliament building in Simferopol on Thursday during a rally by pro-Russian protesters. Gunmen seized government buildings in the city. Tensions continue to rise in Ukraine, where months of public protests led last week to the downfall of President Viktor Yanukovych's government. His opponents are now installing pro-Western ministers to replace the pro-Russian leaders who worked for Yanukovych. The interim government is expected to be in charge at least until new elections can be held, perhaps in late May. Meanwhile, in the Crimea region there have been clashes between the ethnic-Russian majority and those who want Ukraine to remain united. Now, there's a standoff in the Crimean capital of Simferopol, where pro-Russian gunmen have taken over government buildings. Local lawmakers there on Thursday set a provisional date in May for what they hope will be a vote giving the region more autonomy. World leaders are watching closely to see how Russia reacts. Already, President Vladimir Putin has put his military on alert. Diplomats from the U.S. and European Union have urged Russia not to do anything that might further inflame the situation. Defense Secretary Chuck Hagel said Thursday that the U.S. is "closely watching" Russia's military movements. Russian Foreign Minister Sergei Lavrov said he and Secretary of State John Kerry had talked about cooperating in an effort to end the crisis. White House spokesman Jay Carney on Thursday said the U.S. welcomes the Ukrainian parliament's efforts to install new leadership and stabilize the nation. He said Yanukovych had "abdicated his responsibility." -- "Dozens of heavily armed gunmen seized control of local government buildings in Ukraine's Crimea region early Thursday and raised the Russian flag, mirroring the three-month protest movement that drove Ukraine's pro-Russian president into hiding last week." (The Associated Press) There were no reports of injuries at the sites in Simferopol, the local capital. Ukrainian security forces established a security perimeter around the area. As the Parallels blog has written, Crimea "is an autonomous part of Ukraine, [that has] strong emotional ties to Russia and [where] a majority of people identify themselves as Russian. Update at 9:15 a.m. ET: "The Crimean parliament has said it wants to hold a referendum on greater self-rule. Such a vote would be a challenge to the new powers in the Ukraine capital Kiev, the BBC's Mark Lowen reports from the Crimean regional capital Simferopol." Ukrainian officials have said they want to arrest Yanukovych and charge him with mass murder for the deaths of more than 80 anti-government protesters last week in Kiev. Update at 11 a.m. ET: Yanukovych is expected to hold a news conference on Friday in the southern Russian city of Rostov-on-Don, RIA Novosti reports. -- NATO Secretary-General Anders Fogh Rasmussen urged Russia "not to take any action that could escalate tension or create misunderstanding." -- Ukraine's parliament was working to form a new coalition government. According to Reuters, the lawmakers "agreed on Thursday the country should be led by a coalition government and proposed former economy minister Arseny Yatseniuk to lead it as prime minister." Update at 7:55 a.m. ET: The AP just moved this bulletin — "Ukraine parliament approves Arseniy Yatsenyuk as new prime minister." Update at 1:50 p.m ET: "The White House is welcoming the efforts by Ukraine's parliament to stabilize the country," the AP writes, and says ousted President Viktor Yanukovych 'abdicated his responsibility.' Press secretary Jay Carney says Yanukovych left a 'void' that Ukraine's lawmakers are trying to fill."